A civil society-sponsored public meeting in Delhi's Press Club of India has alleged that Tamil Nadu has been turned into a fascist laboratory by India's BJP rulers. Seeking to highlight the "voices from the south", organized by the Delhi Solidarity Group, speakers at the meeting said that, over the past couple of months, the political and social fabric of Tamil Nadu has "slowly deteriorated under an oppressive government, a violent police force and complete disregard for human life for development”. “In the name of development, harmful and devastating infrastructure projects are being imposed upon the people of the state. Most of them are being implemented without following right procedures, one of them being the absolute disregard for Environmental Impact Assessment”, said SP Udaykumar of the People's Movement Against Nuclear Energy (PMANE), spearheading anti-nuclear movement in Tamil Nadu. Man Booker prize winning novelist Arundhati Roy said that the Tamil Nadu government is formulating and putting to practice anti-people and anti-environment policies. From the crisis in Thoothukudi to Unilever, it is washing its hands of improper disposal of mercury in Kodaikanal, the people are battling a repressive state that is singularly interested in development projects. “This is not something new, incidents like these happen in Odisha, Chhattisgarh and other areas, and now the target is Tamil Nadu. We have to be aware and recognize the signs of fascism right now and fight against it actively. We need to stand in solidarity with our people. The media needs to cover these stories, it has to stand by the people and only then maybe we can find a solution to this,” she insisted. She added, "While the entire country is reeling under the Central government’s relentless undemocratic imposition on its people, Tamil Nadu is battling fascism at its peak." Feminist-activist Kavita Krishnan, speaking on behalf of CPI-ML said, “The act of shooting protestors should be seen as an attack on all of us, we are all being targeted and framed. The media in this country needs to start representing its people, they have to critique, they have to expose the state and other such fascist systems, they should be a part of the people." Senior Supreme Court advocate Prashant Bhushan said, “This country is under immense turmoil, we are being put through our paces by a government that only cares about stabilizing private parties and their control over the country’s resources”, adding, “By levying multiple cases on activists, protestors, lawyers and others the government is making sure that the people can create change are being forced to go from court to court, unable to work with the people and unable to organize for legitimate causes." Several lawyers from Tamil Nadu also spoke on the occasion. "The state is witnessing violence like never before. The police are using any way possible to penalize lawyers, activists and any other 'anti-national' elements. From illegal arrests, custodial torture and full-fledged murders, the police are in cahoots with the state-corporate nexus", said senior advocate Senmani. "Each day more and more traditional communities living in potentially resource rich areas are being pushed out, by the show of guns, to lay new harmful development plans", he added. Another senior advocate Velmurugan highlighted how the social fabric of the state is being stretched to its limits, and innocent citizens, protesting for their right to live safely and to rightly govern their own lives and property are being shot at the behest of the authorities. "The situation in the state is so bad that people’s right to dissent is being punished as well. The state has openly targeted me and others people like me who have fought vehemently against it. We are being hounded, we are not allowed to assemble in public, we are penalized for passing out information to the general public, this is highly undemocratic!”, he said. 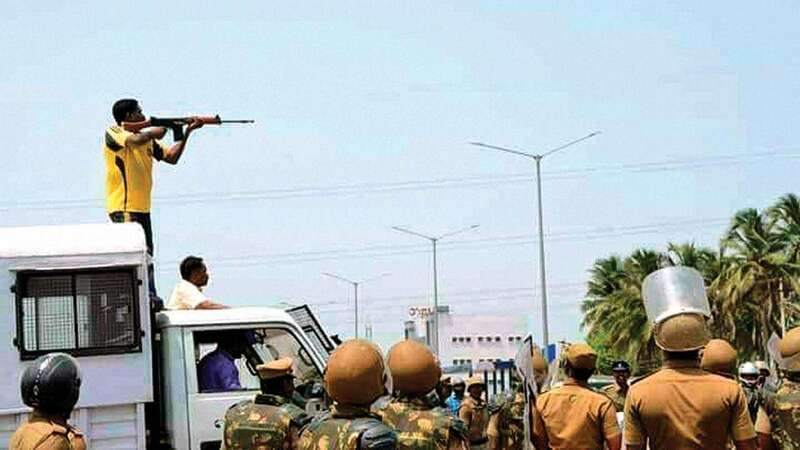 Advocate Vanjinathan, speaking about the state’s open threats, said, “While they shot those at the Thoothukudi protests, the government made sure to convey that any political party, organization, group or association of people that is found opposing the government or protesting will face the same fate."